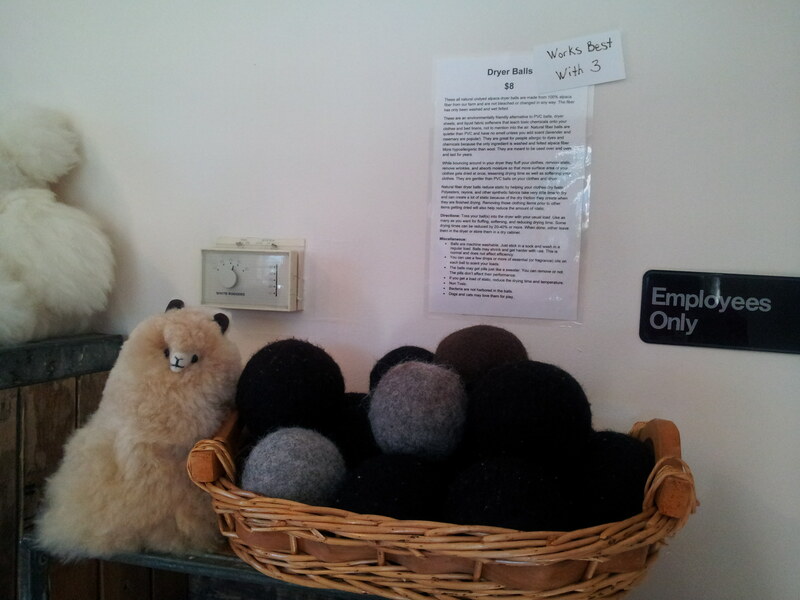 These all natural undyed alpaca dryer balls are made from 100% alpaca fiber from our farm and are not bleached or changed in any way. The fiber has only been washed and wet felted. These are an environmentally friendly alternative to PVC balls, dryer sheets, and liquid fabric softeners that leach toxic chemicals onto your clothes and bed linens, not to mention into the air. Natural fiber balls are quieter than PVC and have no smell unless you add scent (lavender and rosemary are popular). They are great for people allergic to dyes and chemicals because the only ingredient is washed and felted alpaca fiber. More hypoallergenic than wool. They are meant to be used over and over and last for years depending on the amount of laundry. While bouncing around in your dryer they fluff your clothes, remove wrinkles, and absorb moisture so that more surface area of your clothes gets dried at once, lessening drying time as well as softening your clothes. They are gentler than PVC balls on your clothes and dryer. Natural fiber dryer balls reduce static by helping your clothes dry faster. Polyesters, rayons, and other synthetic fabrics take very little time to dry and can create a lot of static because of the dry friction they create when they are finished drying. Removing those clothing items prior to other items getting dried will also help reduce the amount of static. Or add a small squirt of fabric softener to your dryer load. Directions: Toss your ball(s) into the dryer with your usual load. Use as many as you want for fluffing, softening, and reducing drying time. 3 tends to work best. Some drying times can be reduced by 20-40% or more. When done, either leave them in the dryer or store them in a dry cabinet, not air tight or they might mold because of the moisture naturally found in the fiber. Balls are machine washable. Just stick in a sock and wash in a regular load. Balls may shrink and get harder with use. This is normal and does not affect efficiency. You can use a few drops or more of essential (or fragrance) oils on each ball to scent your loads. The balls may get pills just like a sweater. You can remove or not. The pills don’t affect their performance. If you get a load of static, reduce the drying time and temperature. May also add a small squirt of fabric softener. Bacteria are not harbored in the balls. Dogs and cats may love them for play.